Have you ever wanted to see an Australian platypus in the wild? The Mackay Region offers the best and most reliable locations to see these unusual mammals swimming in rainforest creeks and rivers. Journey to Finch Hatton Gorge and Eungella National Park for a natural adventure the family will cherish. The best place to see a platypus in the wild is in the depths of Eungella National Park at Broken River. It takes little over an hour to reach Broken River from Mackay. The best time of day to see a platypus is during dawn or dusk, as this is when they become active to look for food. Starting in Mackay, your platypus seeking adventure starts by travelling 60 kilometres west on the Mackay-Eungella Road, weaving through paddocks of Pioneer Valley sugar cane farms. TIP: Stop for a refreshment in a converted church for coffee among the canefields. Country towns full of charm such as Gargett, Pleystowe, Marian and Mirani are worth exploration on your way through. Feeling peckish? Stop at the famous Pinnacle Pub for one of its delicious pies. 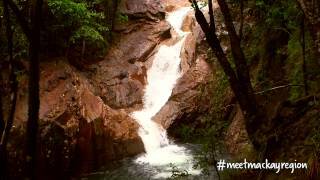 Continue your journey to Finch Hatton Gorge where your first glimpse of a platypus awaits. Discover the world's first platypus SCUBA diving adventure, Rainforest Scuba and come face to face with a platypus in the cool rainforest water. Continue the adventure by walking to one of Finch Hatton's popular waterfalls. Araluen Cascades and the Wheel of Fire Cascades are well worth the walk through the lush landscape of fascinating flora and volcanic boulders. Distance to Araluen Cascades: 2.8 kilometres return. Distance to Wheel of Fire Cascades: 4.2 kilometres return. Another Finch Hatton adventure is Forest Flying. Forest Flying takes you into the tree tops for a fascinating up close view of the pristine rainforest as you glide along a pulley and harness system at your own pace. Drive 30 kilometres from Finch Hatton to the town of Eungella and be treated to beautiful panoramic vistas of the Pioneer Valley. Drive along the Eungella Dam Road to the area known as Broken River. Begin near the café at the Broken River carpark, opposite a camping ground. The platypus path parallels the river to a viewing platform and is suitable for wheelchairs. The short walk only takes a few minutes and caters to all fitness levels. Other attractions can be spotted in the river including turtles and eels. Another great vantage point is from the pedestrian walkway on the Broken River Bridge itself. Platypuses are shy so be patient and quiet. Look for air bubbles rising to the surface of the water. Take binoculars for a better view if they surface on the opposite side of the river. Dawn and dusk are the best times of day to see them. As your platypus adventure draws to a close, enjoy a leisurely drive back to Mackay, or stay in Eungella National park and experience a magical evening in the rainforest.